Martial arts are very similar to physical defense with sharp skills and hand movements. 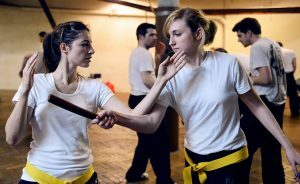 Both women and men who are a part of any form of martial arts training can benefit quite a bit. It includes active movements which at the time may hurt your body but with time will make it easier for you to learn techniques. The first and most important benefit of martial arts is that women will learn to defend themselves. You will learn to be defensive and make a proper application of everything learned while not getting harmed in the process. It’s proven that while practicing martial arts and improving postures and techniques can also help curb cardiovascular illnesses. An improved heart rate will help improve blood circulation too. A healthy heart will help combat problems like lethargy, breathlessness, fatigue, etc. While instructors can help you master all techniques, you will realize that your balance improves too. You will learn how to stand on one leg while performing various actions too. While practicing martial arts regularly, you will notice an improved fitness as well. You will never have to worry about obesity and this will let you live a good, healthy lifestyle. While you will be exercising most of your body parts, your muscles will become more flexible too. Your posture will get better, and your gait will improve too. You can tackle a lot of minor injuries this way without worrying about your body breaking down.